French jewelry firm established by Frédéric Boucheron in 1858. 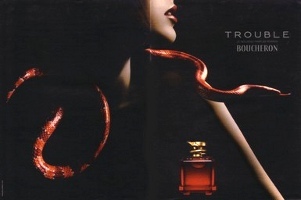 Their first fragrance, Boucheron, was introduced in 1988. Other well known fragrances include Boucheron Pour Homme (1991), Jaipur (1994), Jaipur Homme (1997), Jaipur Saphir (1998), Initial (2000) and Trouble (2004; see review for Trouble Dry Oil Spray). The Boucheron fragrance license moved from L'Oreal to Inter Parfums in 2011; at that time, they reportedly discontinued all of the existing fragrances other than Boucheron, Boucheron Pour Homme and Jaipur Homme. Recent releases include Trouble Eau Legere (2006), Jaipur Homme Fraicheur (2006), Miss Boucheron (2007), B de Boucheron (2008), Jaipur Bracelet (2012), Jaïpur Bracelet & Jaïpur Homme limited editions (2013), Place Vendôme (2013), Place Vendôme Elixir (2014), Quatre (2015), Quatre Pour Homme (2015), Place Vendôme White Gold (2015), Quatre Intense (2016), Ambre D'Alexandrie, Iris de Syracuse, Néroli D'Ispahan, Oud de Carthage, Tubéreuse De Madras & Vanille de Zanzibar (2017), Quatre Absolu de Nuit (2017), Quatre En Rose (2018), Santal De Kandy (2018). The Boucheron fragrance line can be found at major department stores, or online at the various fragrance discounters. See all articles on Now Smell This tagged Boucheron.